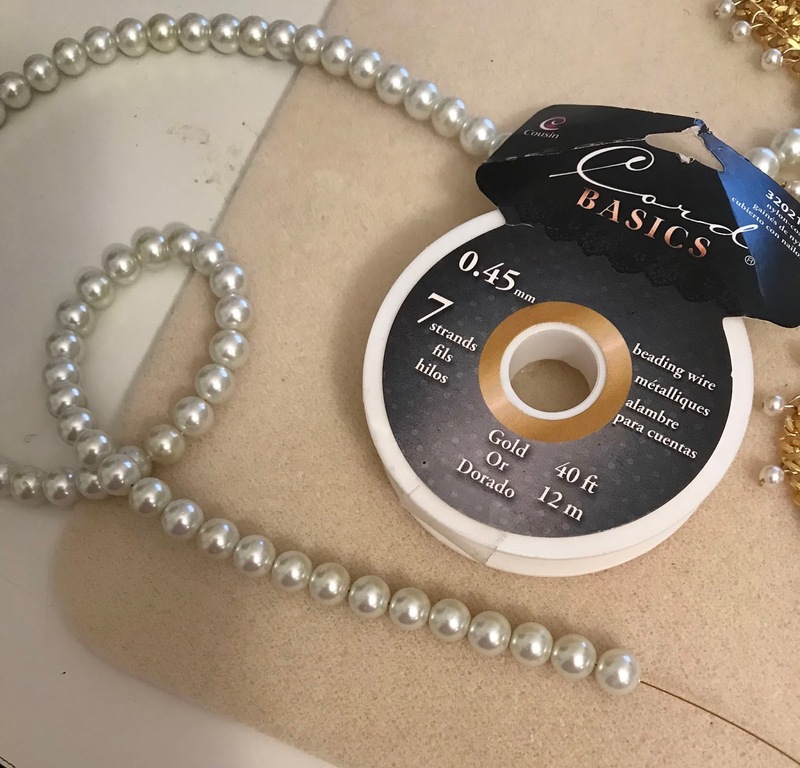 Leave the circle open, and connect on another eye pin to the circle and then squeeze it shut using needle nose pliers. 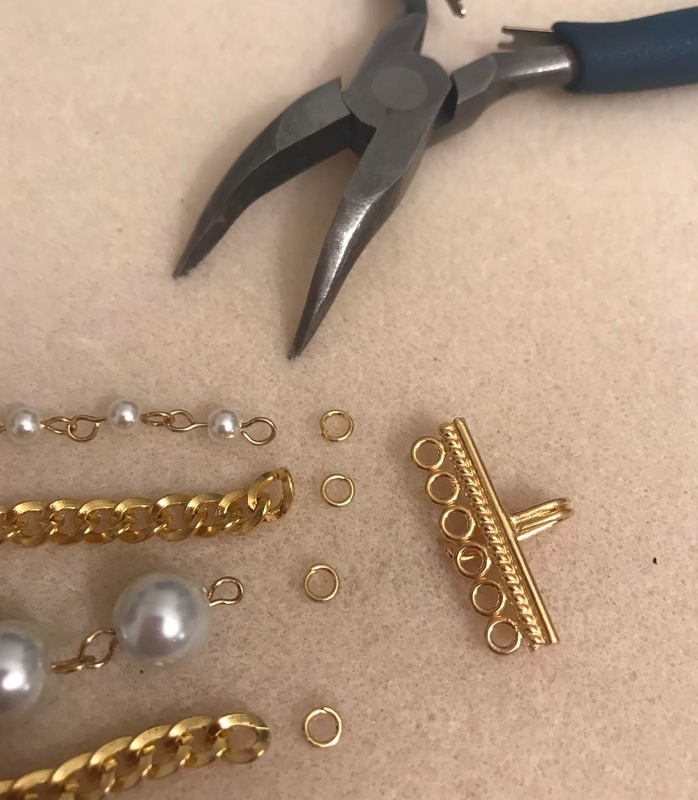 Start the process over again on the new eye pin to add another pearl and continue making a chain. 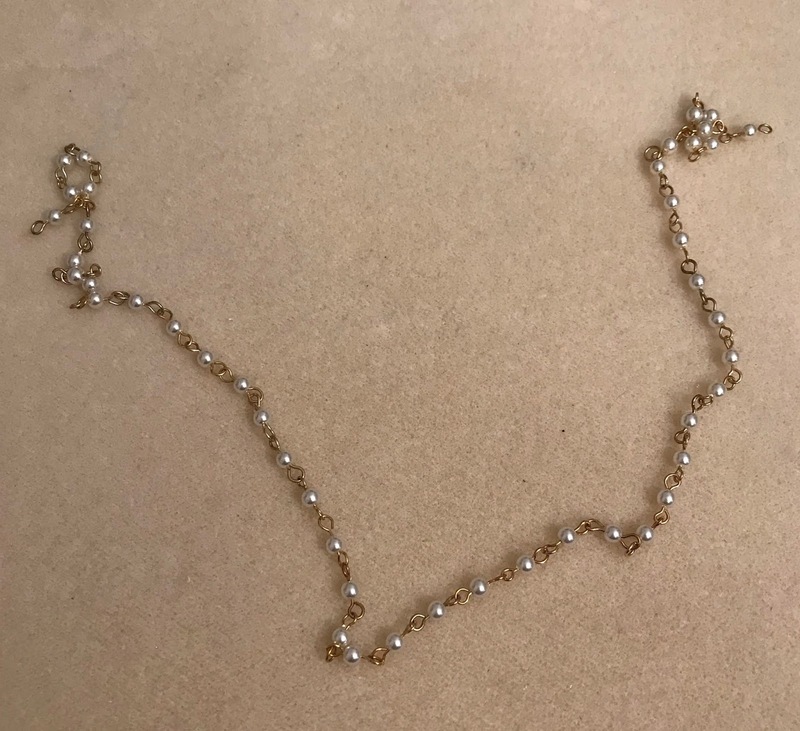 My pearl strand was about 20 inches long. 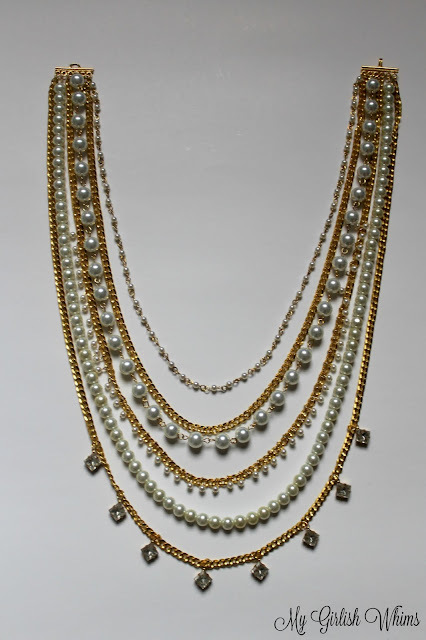 Next, repeat this same process using larger 10mm pearls. 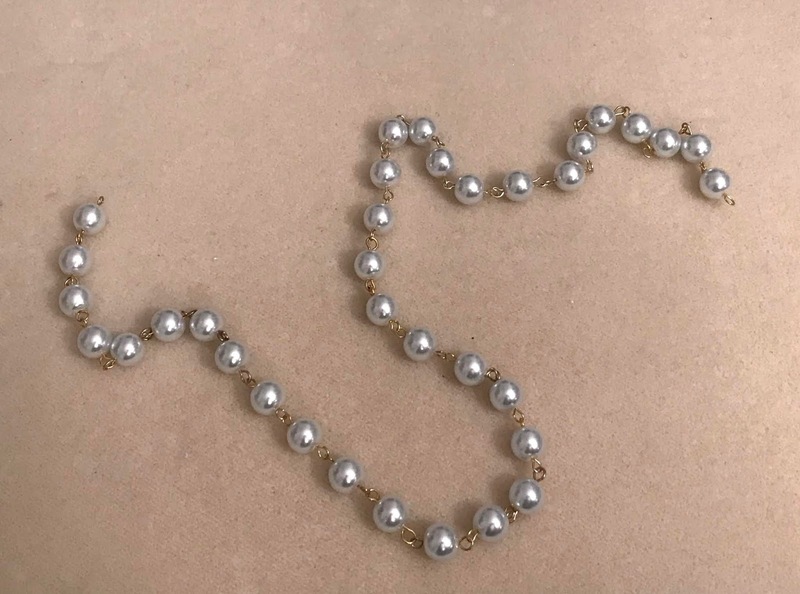 My larger pearl strand was about 23 inches long. 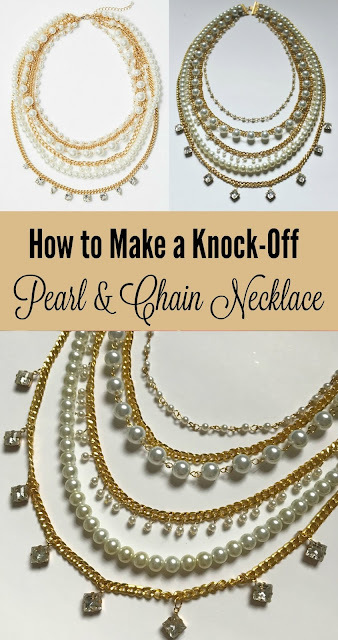 Next, you will need to cut three different lengths of chain using wire cutters. My chain lengths were approximately, 22 inches, 24.5 inches, and 29 inches long. 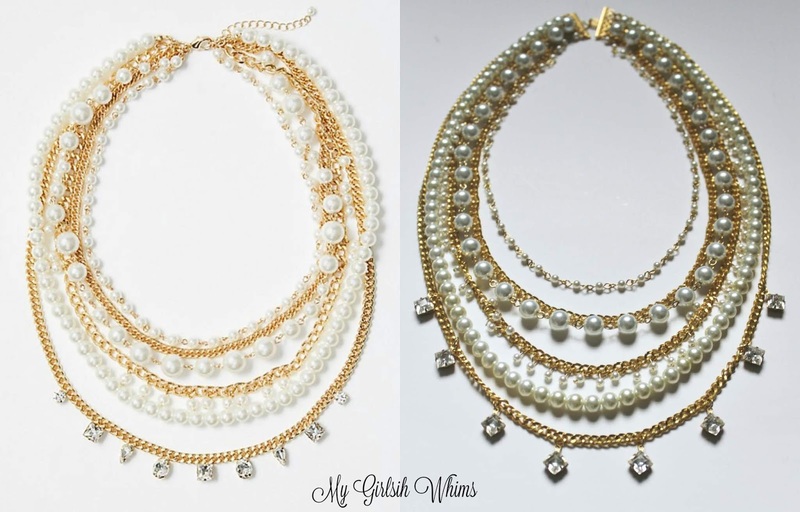 Set aside the shortest strand and longest strand, and grab the medium strand for now. We are going to add pearl charms to this chain length. 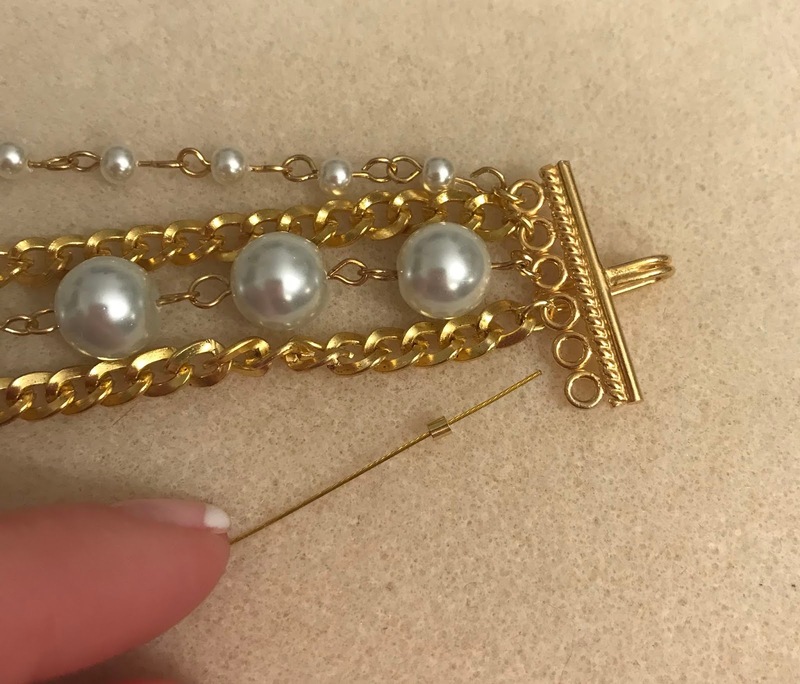 To create the charm, you just need to create a simple loop with each pearl on a head pin. Add a pearl onto a head pin. 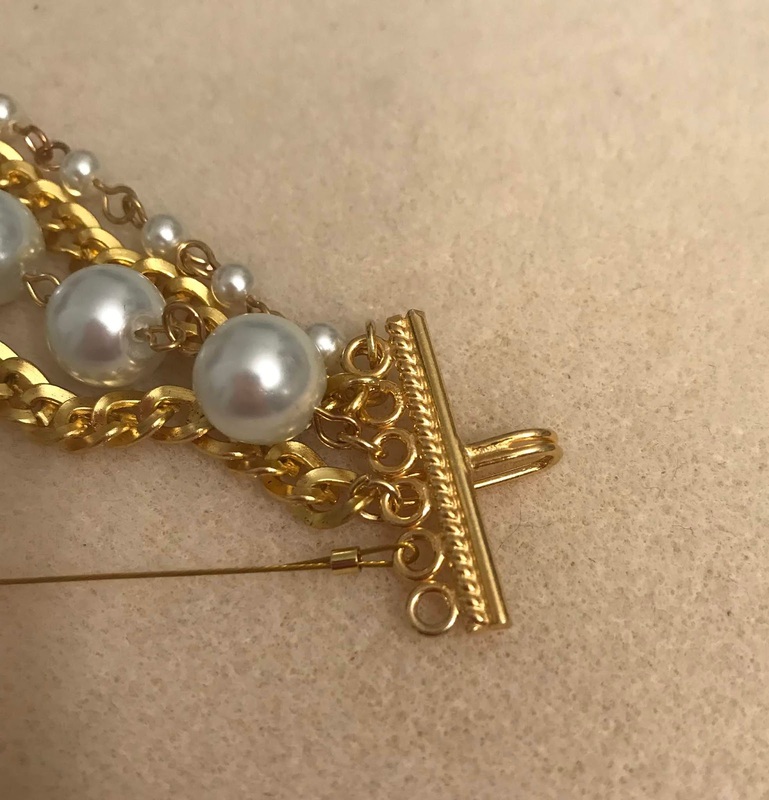 Grab the pin directly above the pearl with needle nose pliers and then bend it back 90 degrees. Trim off all but about a 1/2 inch tail using wire cutters. Grab the end of the tail using round nose pliers and bend it back around the pliers to create the simple loop. 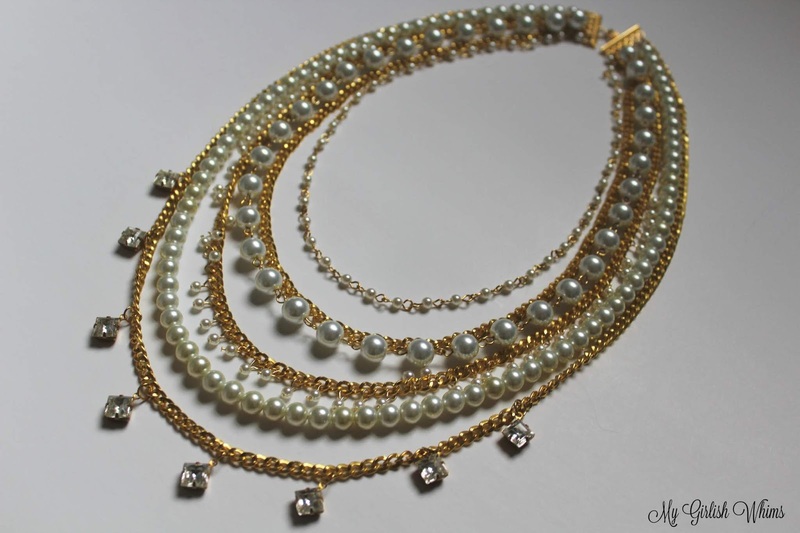 From here, find the center of your medium length of chain and add the pearl charm onto the chain. 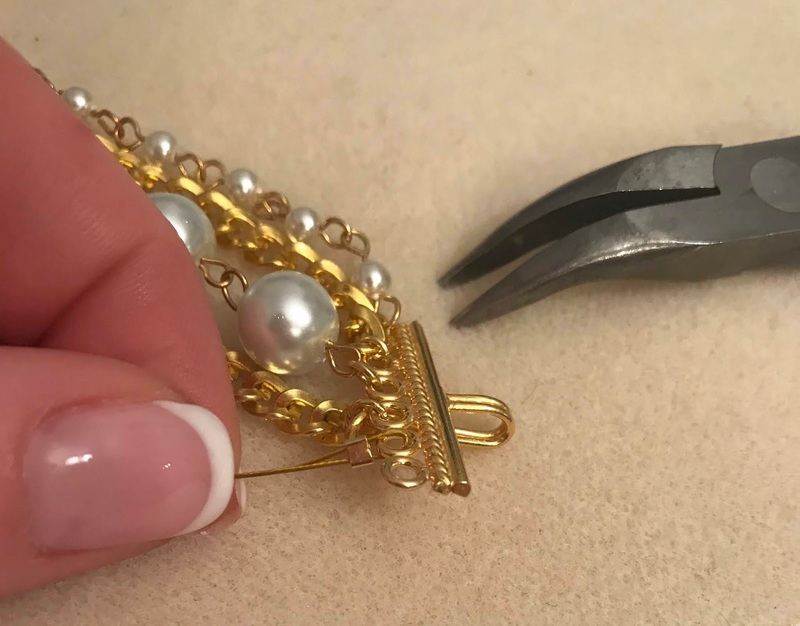 Squeeze the loop shut using needle nose pliers to secure it into place. Repeat this process alternating every other chain link until you have filled most of the chain with charms. I left about a 4 inch tail on each end of the chain so it would lay better when worn. For the next strand you will need to string pearls onto beading wire. Using your 8mm pearls, string them onto beading wire until you have a finished length of about 26.5 inches. 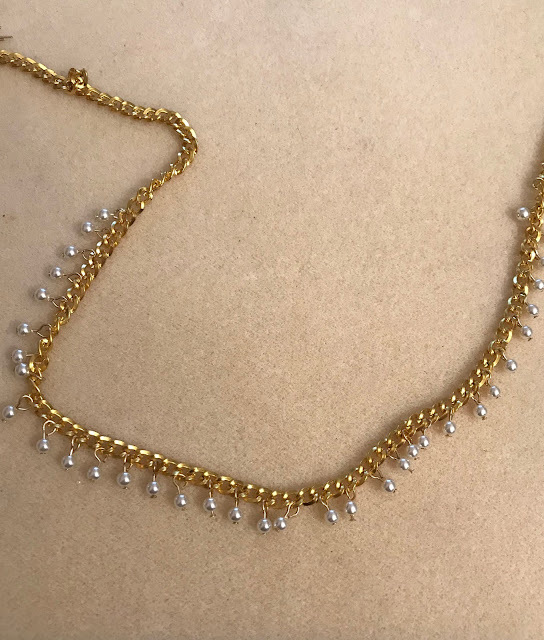 Cut the strand, leaving about two inches of extra beading wire on each end of the pearls. 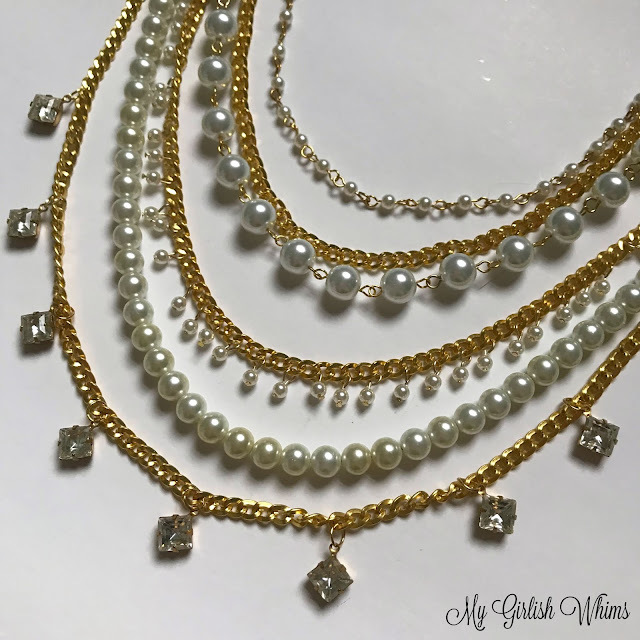 For the last strand, grab your longest length of chain and find the middle of it. 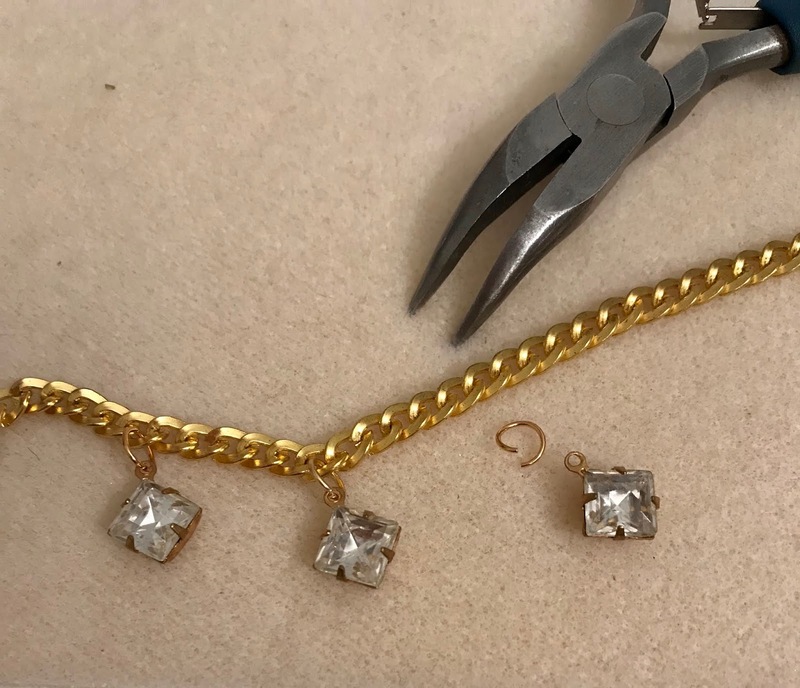 Attach a 6mm jump ring to each of your crystal charms and begin attaching them to the chain by closing the jump ring using needle nose pliers. I had 8 charms total so I spaced them out in between the middle of the chain, leaving about 8 links between each charm. Now it's time to bring everything together! Assemble your strands (all but the pearls on beading wire) in order of length next to your multi-strand connector. 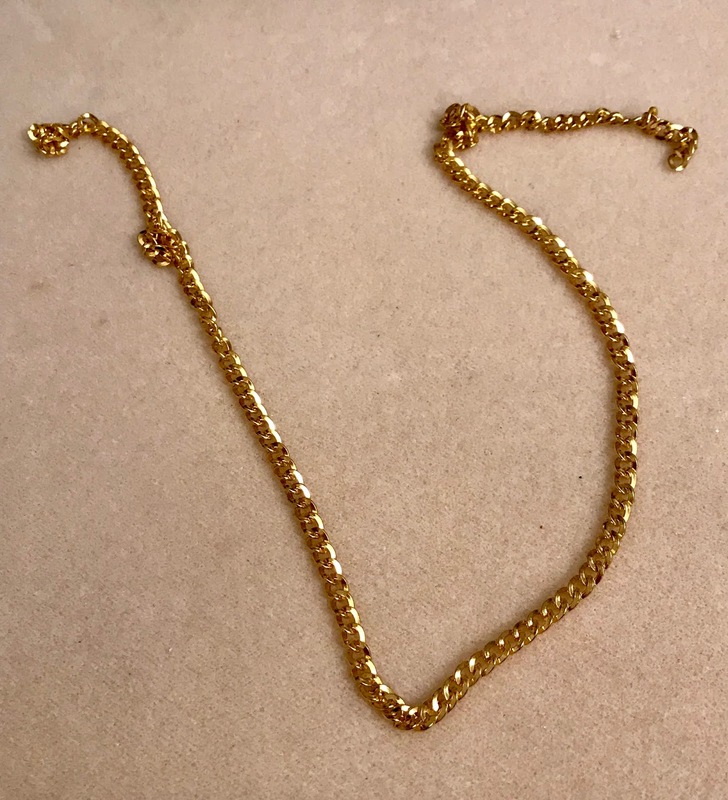 Connect the first four shorter strands to the loops on the multi-strand connector using 4mm jump rings. Attach the pearls strung on beading wire to the connector using a crimp bead. 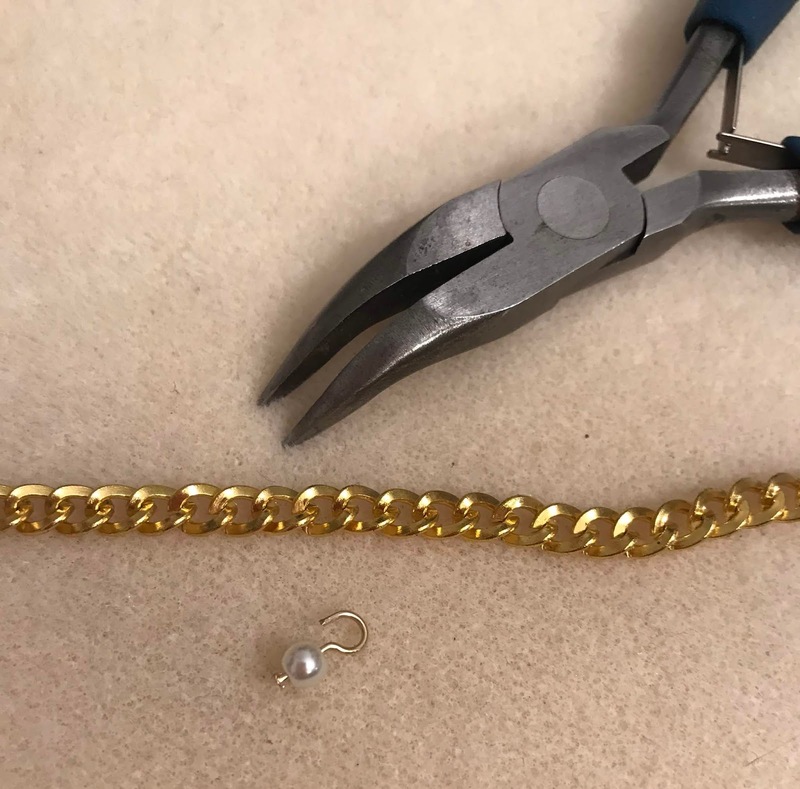 String a crimp bead onto the wire and then loop it through the connector hole. Bring the wire around the connector hole and then feed it back through the crimp bead. 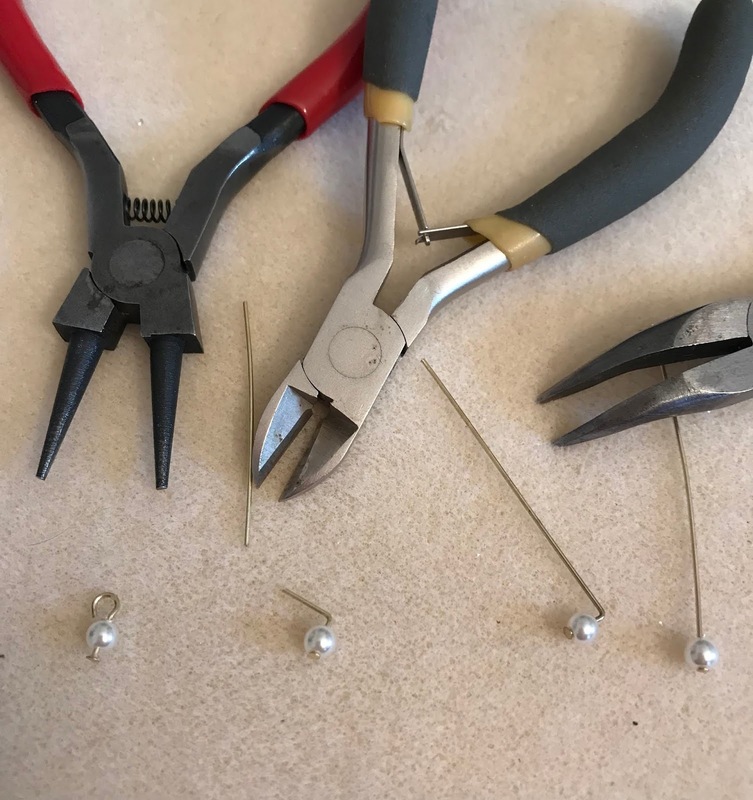 Squeeze the crimp bead shut using needle nose pliers, securing the wire to the connector. Use wire cutters to trim off any excess wire tail. Attach the last longest piece of chain to the final connector loop also using a 4mm jump ring. Repeat this same process to attach each strand to the other multi-strand connector, and then your necklace is done! It think it looks like such a pretty work of art on its own, not even being worn! 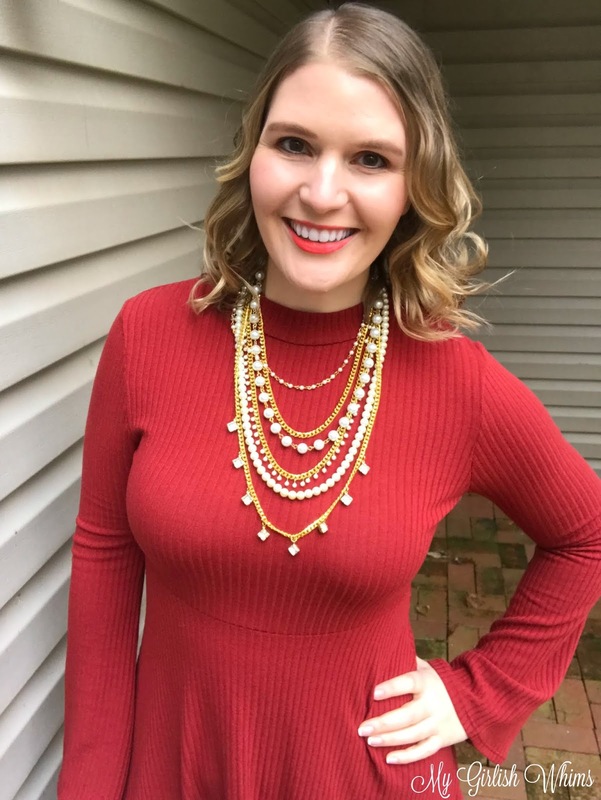 But of course, I've already worn it plenty of times since I made it and get compliments on it every time! 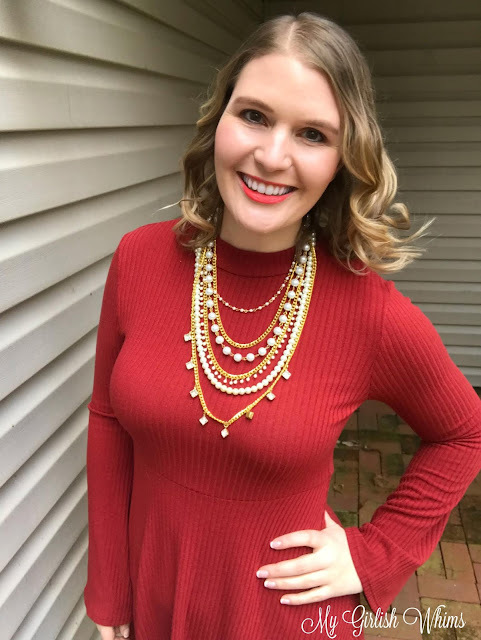 It worked great as a festive necklace to wear around the holidays, but it would also work well to jazz up a basic white collared shirt or similar plain outfit. I sure am glad I actually decided to open that email from Loft instead of just deleting it like I normally do...that ad gave the perfect inspiration for one of my favorite knock-offs yet!